When asked if the kingdom had come, Jesus told John’s disciples to look around and see the deaf hear, the blind see, the poor receive good news, and the dead rise up (vv. 4-5). And I wonder if John might be in the same position as the singer in Folsom Prison Blues, who heard the train passing by and imagined the “rich folks eating in a fancy dining car, probably drinking coffee and smoking big cigars.” Surely John would have recognized the kingdom Jesus was bringing, even if there wasn’t as much judgment as he had imagined (see 3:8, 12). Nevertheless John’s in jail, and the one who first felt Jesus’ coming more fully that anyone else is unsure if Jesus will actually bring it. In another place, Jesus says that this coming kingdom includes the captives’ release, but John is still in there in prison (Luke 4:18). And I wonder if John’s doubt comes, not from an inability to see where Jesus works in the world, but from the ways that he remains imprisoned in a kingdom marked by liberation. Then Jesus turns to the crowd, lest we think that he had condemned John in the first scene. Three times he asks them, “What did you go out to see?” (vv. 7-9). They didn’t go out to see “a stalk blowing in the wind,” nor did they go out to see “a man dressed up in refined clothes” (vv. 8-9). Instead, they went into the wilderness, far away from the palace, to hear John bringing the news that came from God. It may seem impossible for God to come into the places we are, or even into parts of who we are. John, seeing all that Jesus brought into the world, was cut off from it, so he asked if he should start looking again. 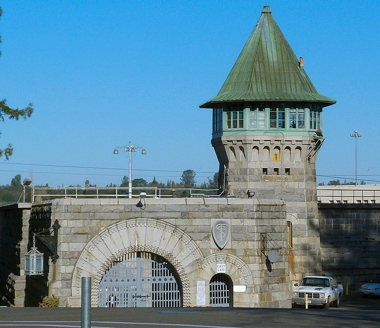 The singer in Folsom Prison Blues heard the train passing by, longed to be on it and ride it down the line. Surely God wouldn’t come into the places where they were, or even into those places where we often find ourselves. But Jesus tells the crowd, and us too, to look around and see that it’s not in the palace where God chooses to come into the world, but the wilderness—not on the train, but in the prison. • In what places of your life is it hard to imagine that God, and healing, can come? What hope can be found in this passage? • What places seem cut off from the healing and freedom that accompanies the kingdom that Jesus brings? How can the kingdom come even in those places? • In what ways are we in the palace? In what ways are we in the wilderness? What can we do to be more receptive to the kingdom Jesus brings? What can we do to help Jesus bring the kingdom? The evaluation of John becomes more ambivalent in 11:11. On the one hand, no one born of woman is greater than John; on the other hand, the least in the kingdom of heaven is greater than he. Why? The answer must be related to John’s query in 11:2-3. He has not been privileged to perceive the full significance of the arrival of the Christ. The implication is that John had set the stage for God’s great drama of salvation and did not realize the significance of his role or how the drama would unfold. He is a perfect example of human finitude; he was profoundly right and profoundly wrong at the same time. Even being the greatest of the prophets does not insure full recognition of what God is doing. Nor does it spare one from having a crisis of faith. In many ways, John is like Moses, who brought the people of Israel to the outskirts of the promised land but who did not enter the land of rest himself (Manson, Sayings, 70). John and his disciples still belong to the old (9:14-17), primarily because they are not disciples of Jesus. That the least in the kingdom are greater than John also implies that status in the kingdom of heaven is conferred by grace. The concluding unit of this section (11:25-30) makes it clear that those who understand who the son is are nobodies, dismissed by the “wise and understanding” as “simpletons.” They understand simply because it has been given to them (11:27; 13:11, 51; 16:17). David E. Garland Reading Matthew: A Literary and Theological Commentary, Reading the New Testament Series (Macon GA: Smyth & Helwys, 2001), 128–29. Frequently the Gospels set forth the “acts of power” (dunameis, MIRACLES) of Jesus as manifestations of the Kingdom of God. Matt 11:5 gives Jesus’ reply to John the Baptist’s question as to whether he was “the coming one”; it is virtually a citation of Isa 35:5-6, which describes in glowing colors the transformation God will bring when he comes to save his people. In effect, therefore, Jesus is saying, “It’s all happening now—and that answers your question!” When accused by his opponents of being in league with the devil Jesus told a parable, indicating that only one who overcomes a strong man can take away his goods (Mark 3:27); his release of Satan’s victims takes place because he has overpowered him. Matt 12:28 (= Luke 11:20) draws the consequence: “If it is by the Spirit [“finger,” Luke] of God that I drive out demons, then the kingdom of God has come upon you.” For other sayings of Jesus which set forth the same message cf. Matt 11:12-13; 13:16-17; and Luke 17:20-21. Such sayings show that God’s royal saving action has begun in Jesus. They do not mean that the Kingdom has no future. On the contrary Jesus often spoke of the future manifestations of the Kingdom, as in the prayer he taught his disciples (Matt 6:9-10) and the beatitudes (Matt 5:3-12). Many of his PARABLES depict the Kingdom of God initiated in his ministry in relation to its future consummation, notably the parables of Mark 4 and Matt 13. In all these the tacit assumption is that Jesus is the mediator in the present of the Kingdom awaited in the future. G. R. Beasley-Murray, “Kingdom of God,” Mercer Dictionary of the Bible, ed. Watson E. Mills et al. (Macon GA: Mercer University Press, 1990), 487–88.